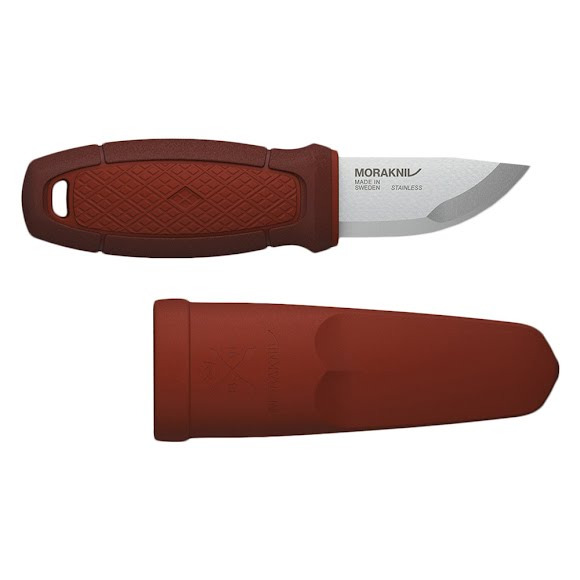 This Morakniv blade is 2 mm thick and 59 mm long, or in this case, short. This means that the knife is simple and efficient to keep in your pocket or rucksack, and you still get all the benefits of strength and safety from the fixed blade. The blade is made of 12C27, a high quality Swedish stainless steel that is treated through our unique processes in our factory in Mora. This Morakniv blade is 2 mm thick and 59 mm long, or in this case, short. This means that the knife is simple and efficient to keep in your pocket or rucksack, and you still get all the benefits of strength and safety from the fixed blade. The blade is made of 12C27, a high quality Swedish stainless steel that is treated through our unique processes in our factory in Mora. What&apos;s more, the handy size of the blade suits the varied situations you can encounter on your hike, camping trip or when hunting. The knife has a secure grip made out of two different polymers and a click lock, making the knife safe to handle. Perfect for both new and experienced adventurers. In addition to a top knife, you also get an accessory kit that takes Eldris to the next level. Thereâ€™s a paracord rope so you can hang the knife around your neck, and a secondary lock so the knife sits even more securely in the sheath. The kit also includes a fire lighter that matches the size of the knife, perfect when it&apos;s time to light the campfire or camp stove.